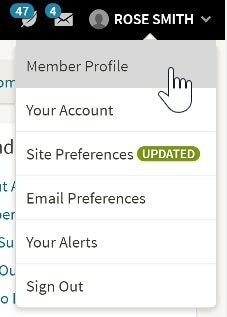 When you register on or subscribe to Ancestry, you will provide personal information (such as your name, email address, and credit card information) that we use to manage your account; other than your name (if you choose to share your name in your profile settings), other Ancestry users cannot see this information. 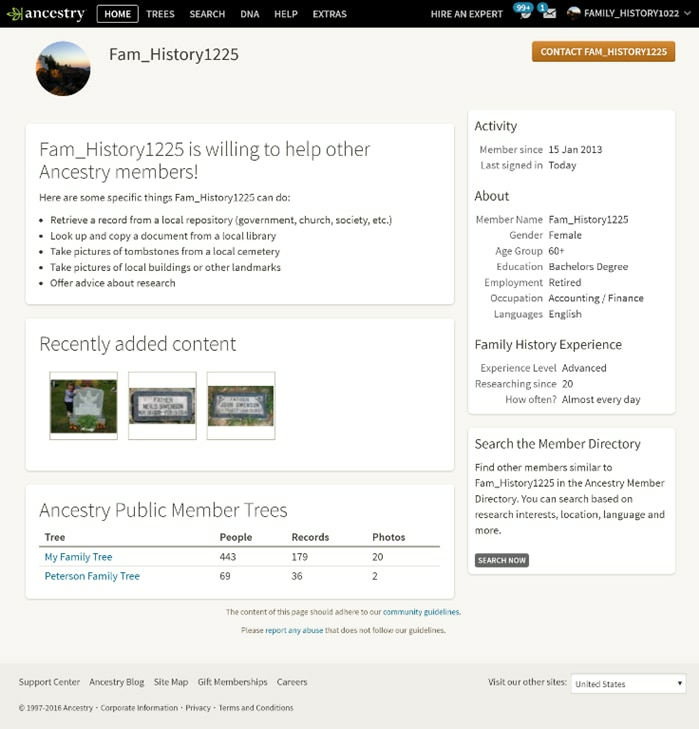 You will have a public Ancestry profile that you can control and that helps you connect with other users. Does my Ancestry profile disclose personal information? Your member profile lets you share information about yourself with others in the Ancestry Community. Although profiles are public by default, you can control what information you want other users to see. When you last logged in. You can also add additional personal information (such as gender, age, and occupation), a photo, location, research interests, and more to your profile. For more information and instructions, see our Support Center. Can Ancestry users contact each other? It is important to us that you feel safe communicating with other members of the Ancestry Community, so we’ve created an online messaging service that lets our users contact each other anonymously. When another user sends you a message, you’ll receive an alert in your Ancestry inbox and an email. You can respond through the Ancestry website without sharing any personal contact information with the sender (except your username). Ancestry stores these messages as described in our Privacy Statement. You can also choose not to communicate with anyone or block specific users. To update your contact preferences, click on your username in the upper right corner and select Site Preferences. Can other Ancestry users see my activity on Ancestry? Things you publicly add or post to the site. This includes information on deceased individuals in your public member tree, message board postings, or other publicly posted content. Personal research activities. This includes records you save to a private member tree (without sharing information from your tree) as well as records you save to your Shoebox. To change these settings, go to Activity Preferences. If your tree is public, other users can view all content in your tree except information about living people and notes. Other users can also see your username or full name depending on your account settings. See Privacy for Your Family Tree for more information. Anything you post on message boards is public. If you ever have a concern about what is being shared, you can contact a Message Board Administrator at messageboards@rootsweb.com. How do Facebook and Ancestry work together? With your permission, Ancestry can use your Facebook account to enhance your experience on the Ancestry website(s). You can save time by signing into Ancestry using your Facebook login. If you don’t want to remember another username and password, you can sign in to Ancestry using your Facebook login. (You can still sign in using your Ancestry username and password; this just gives you an additional option.) Facebook will ask you to verify that they have your permission to share certain information with Ancestry. Using your Facebook credentials to login won’t share your Ancestry account information with Facebook, and we won't post anything to your Facebook wall or contact your Facebook friends without your permission. You can use your Facebook account information to build a new family tree or to update a tree you already have. We respect Facebook profile settings and will only access the information from your Facebook account that they tell you about or you have given us permission to access. We will also ask you to confirm all the information we access before including it into your family tree. Also, we won't post anything to your Facebook wall or contact any of your Facebook friends unless you permit us to do so. Be aware that when you use Facebook information in your family tree, you are explicitly granting Ancestry permission to retain and use that information in accordance with the Ancestry Terms and Conditions and Privacy Statement. What other information does Ancestry collect about me? To learn more about cookies, please visit Cookies and Advertising section of the Privacy Center. Does Ancestry use system information? If you access our websites using a mobile device (e.g. your phone or tablet), we collect additional information from the device including its mobile device identifiers, the device type, IP address and the operating system. We use mobile analytics software to allow us to deliver you our websites and better understand the functionality of our websites.